On a beautiful, sunny day, you simply have to be outside. But when you step outdoors, where do you go? To the park? The lake? A friend’s home? How often do you stay home and enjoy the beauty of your own outdoor space? If your answer is not often or never, it’s time to create your own home field advantage. With just a few simple improvements, you can make even the smallest outdoor space feel comfortable and welcoming to you and your guests. Start with these five projects and you’ll make your own yard the place to be when the weather turns beautiful. * Replace the cement with a raised deck. That old cement patio or walkway in your backyard may be unsightly and uninviting, but it doesn’t have to be that way. You can make that space much more appealing by replacing it with a raised cedar deck. Easy to build and affordable as well, a raised cedar deck makes the entire area more inviting without taking up any additional space. Cedar is also naturally resistant to rot, decay and insects, and it is cool underfoot. * Light smart. Your current outdoor space may have only a single light or it may have no light at all, making it impossible to use at night. To make the space more welcoming, add string lights or uplighting to your outdoor area. These lights are available in a wide array of styles to match your personality and they take up very little space, allowing you to create the perfect — well lit — environment you’re looking for. * Focus on furniture. If finding the right furniture to fit your space has been difficult, consider making your own instead. Building a customized bench or sectional is easier than you think and it allows you to build your furniture to meet the design requirements of your space. Western Red Cedar is pitch and resin free so it accepts and holds a wide range of finishes to match your style choice. You can even add built-in storage to your bench or furniture design for more space-saving solutions. Visit www.realcedar.com for building plans. * Place a plant or two. The right plant could provide just the pop of color your outdoor space needs. Herb gardens, hostas, even a pot of flowers all up the scenic appeal of your outdoor area. If space is a concern and you have a pergola structure, hanging plant baskets are a great option, so you can enjoy their beauty from above. * Play a zone strategy. When space is at a premium, you need to utilize every inch. 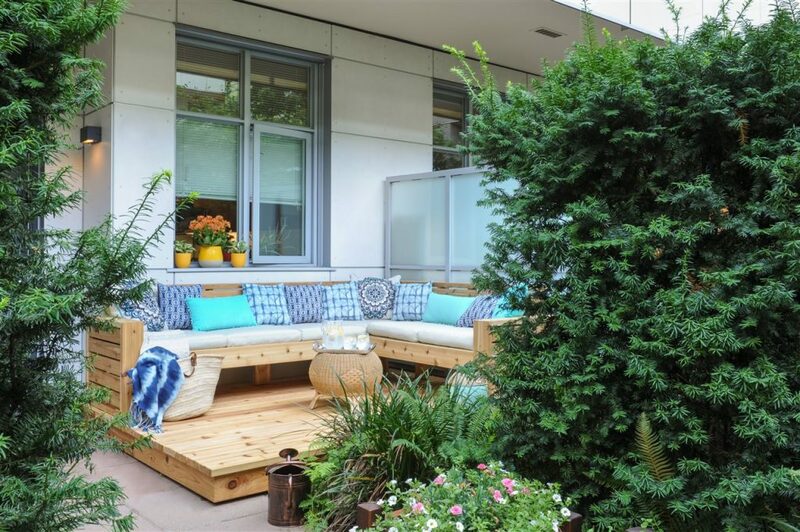 To do this, segment your outdoor space into defined zones such as cooking, relaxing and eating areas. You can then further define these zones by adding the perfect finishing touches to each like a barbecue enclosure for your cooking area and a pergola over your dining table. Each of these DIY projects is a worthy addition to your outdoor space and will make it the area you can’t wait to enjoy every time you step outside.